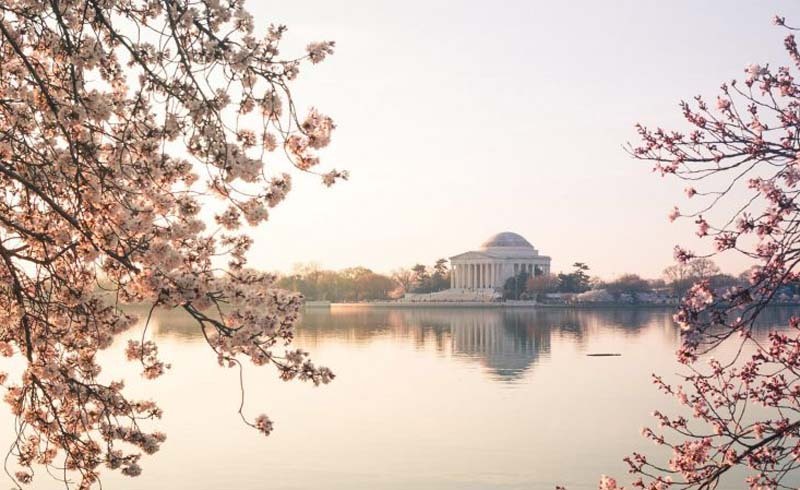 Many travel wish lists include a trip “to see the cherry blossoms.” To many, the cherry blossoms represent a quintessential travel bucket list experience. However, any trips that are so intrinsically tied to the whims of nature have built-in planning challenges. If such a trip is on your radar, here are some tips to mitigate some of the planning challenges and maximize the enjoyment of the natural beauty that ushers in spring. There are some certainties in life, like death and taxes. 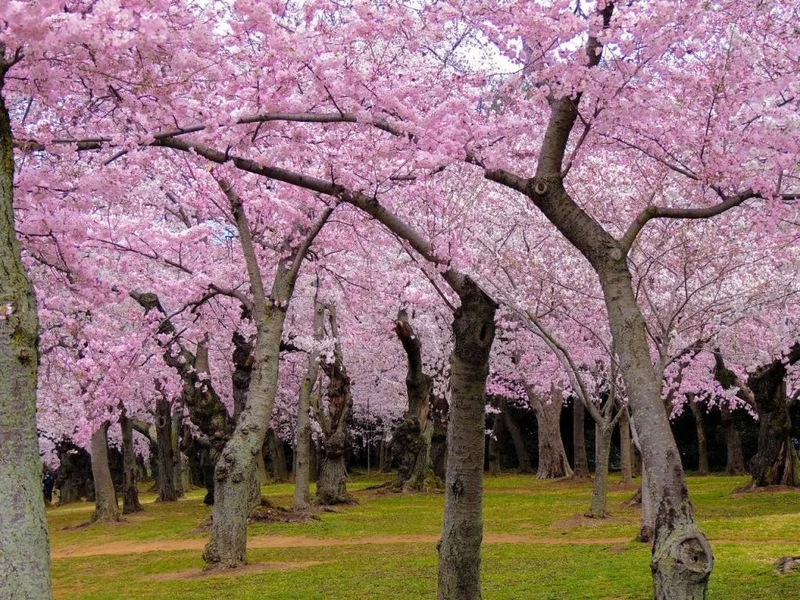 There are, however, many more uncertainties, and predicting the peak bloom dates for Washington, DC’s famous cherry trees certainly has to be included on that elusive list. They will (likely) bloom sometime between mid-March and mid-April. However, that one-month window can feel like a pretty wide wide chasm when planning a two or four-day trip. That window can mean the difference between seeing unopened buds, magnificent blooms or weathered flowers littering the sidewalks and floating in the Tidal Basin. Only one of those options sounds trip-worthy to me. Unless you are already tied to specific days in the DC area, try to remain flexible with your plans. This is a great time to familiarize yourself with Cherry Blossom Watch. The website offers the latest updates and current photos of the cherry trees. It provides pertinent weather info, chronicles bud stage development and will predict peak bloom dates as spring nears. There is also relevant travel information provided for the DC area. Through that site, you can register for a weekly email newsletter and even sign up for push notifications that will automatically show up in your Chrome, Safari or Firefox browser. In conjunction with the website, follow the Instagram posts at @cherryblossomwatch. The reports here will be less detailed but will offer fresh photos with more frequent posts than on the website. 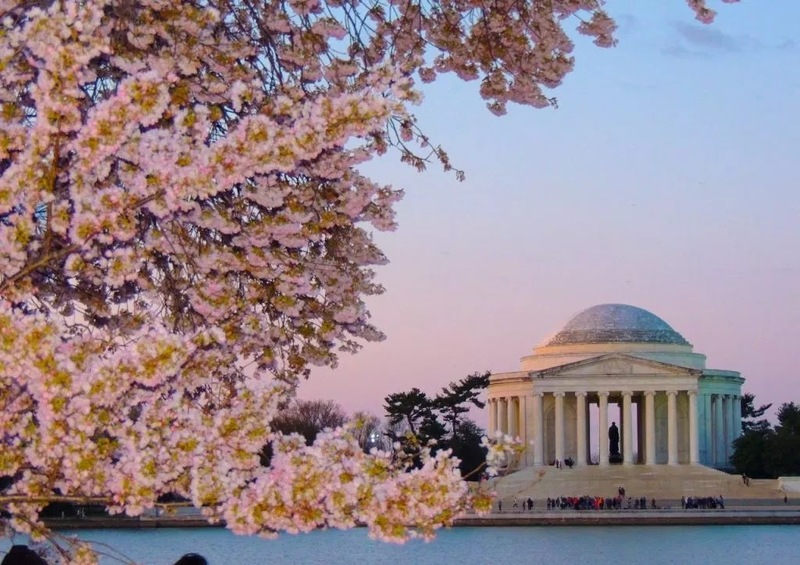 You can also find good information on the National Park Service’s Cherry Blossom Festival webpage, and the official National Cherry Blossom Festival site. Frankly, it’s still way too early to make any educated guesses about peak bloom dates for 2019. Even last-minute temperature fluctuations in February and March can impact when the flowers open up. 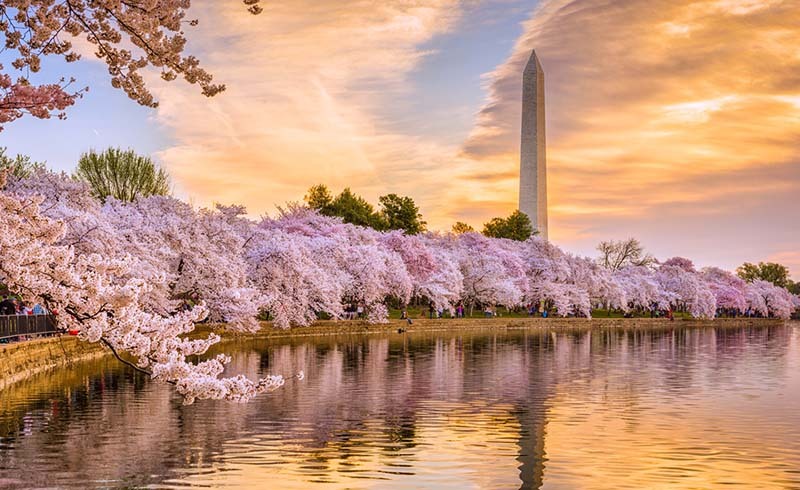 Unless you live within driving distance of the capital, you will likely take to the air to visit these DC cherry blossoms. Three major airports service the area: Reagan National (DCA), Dulles (IAD) and Baltimore/Washington (BWI). 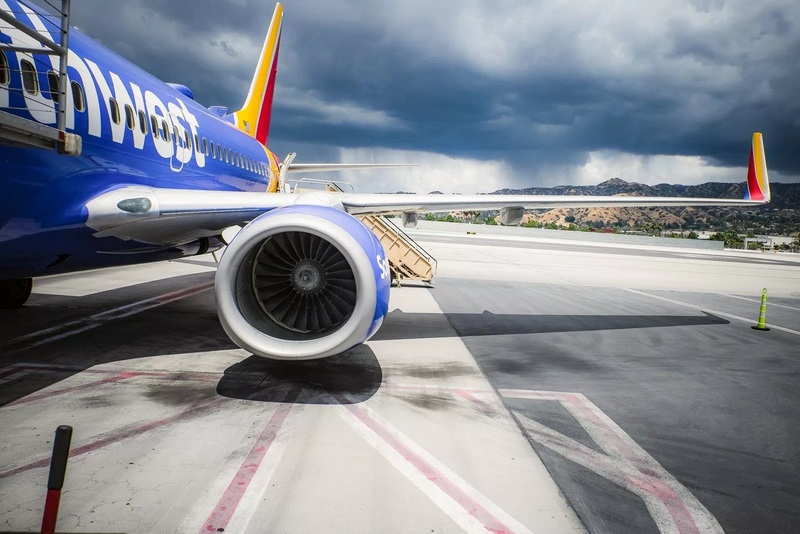 Unless you are flying Southwest, which does not charge change fees, or are booking through a loyalty program that allows free or inexpensive changes on awards, this is one of those times we don’t recommend booking airfare far in advance. When my family went on an odyssey to see the cherry blossoms, we initially booked our late-March flights in early February. We based our decision on historic dates, guesswork and available information. When the National Park Service and The Washington Post’s Capital Weather Gang first issued their 2018 predictions for the optimum blossom viewing, we were wrong on all counts. The “official experts” expected the best dates to be about 10 to 14 days before our arrival. Since the entire purpose of our trip was to see the cherry blossoms, we changed our flights (which we had booked with points). We swallowed a $150 change fee that we considered a luxury tax to properly enjoy what we considered a once-in-a-lifetime experience. Seven to 10 days later, after watching the buds go into a state of suspended animation because of weather, the prognosticating powers moved their best guess to almost three weeks later. So, we adjusted our flights again. But this time, our original carrier no longer had availability, and we had to book with another airline, use more points and pay $160 for close-in award usage. The end result was that the blossoms were indeed spectacular and well worth the points and cash, but we certainly learned some lessons the hard way. While we don’t normally fly Southwest, as Houston Hobby (HOU) is not convenient for us, we would strongly consider flying them on any similar future endeavor. Those with the Companion Pass would be ever better served by selecting Southwest. The other option would be to wait as late as possible to book flights. Even if the fares or mileage requirements might be higher, it would be cheaper than multiple changes and the subsequent points lost. Hotel accommodations are in high demand during cherry blossom season, and we obviously had to alter these reservations, too. While it’s often easier to cancel and rebook rooms than flights, we suggest securing a few refundable hotel reservations and canceling the ones not utilized. We ultimately stayed at the Hyatt Place Washington, DC/ White House on points. This hotel is about a half-mile north of the White House and a little over a mile to the Tidal Basin and the cherry trees. Two metro stops are within a few blocks of the hotel. Right now, rooms here are available from approximately $450 a night on weeknights in late March. 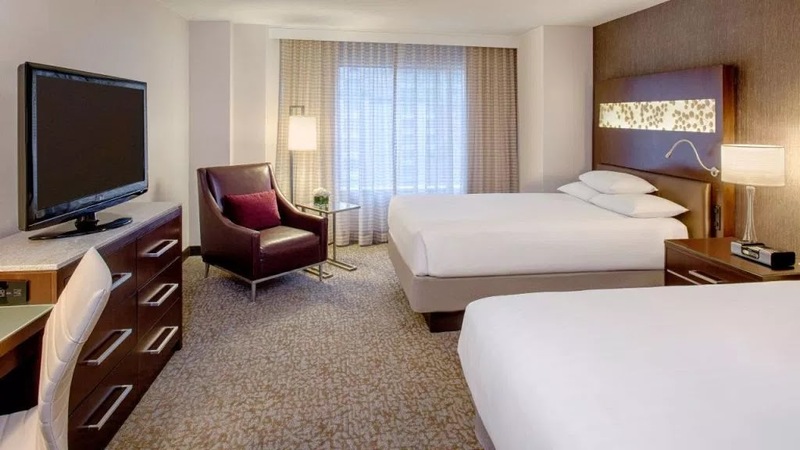 However, the rooms are available for just 12,000 World of Hyatt points, which means you can even use a Category 1 through 4 award from the World of Hyatt Credit Card. The nearby Grand Hyatt Washington, DC is another great choice at just 15,000 World of Hyatt points per night (and it has a club lounge). The cherry trees attract large crowds throughout the day, and weekends are obviously more crowded than weekdays. If you are available to go to DC on a Monday, Tuesday or Wednesday, you will have a little more elbow room. There are aficionados that even arrive before dawn to capture the scene. There are more than 3,000 trees that surround the Tidal Basin, so there are plenty to share. The hike around the Tidal Basin is just over two miles, but it is flat, paved and beautiful. You will pass the Thomas Jefferson, Franklin Delano Roosevelt and Martin Luther King Jr. memorials on the trail. And the cherry trees are not restricted to the Tidal Basin. Small groves can be found throughout the area. Arlington National Cemetery can be just as beautiful as it is poignant. 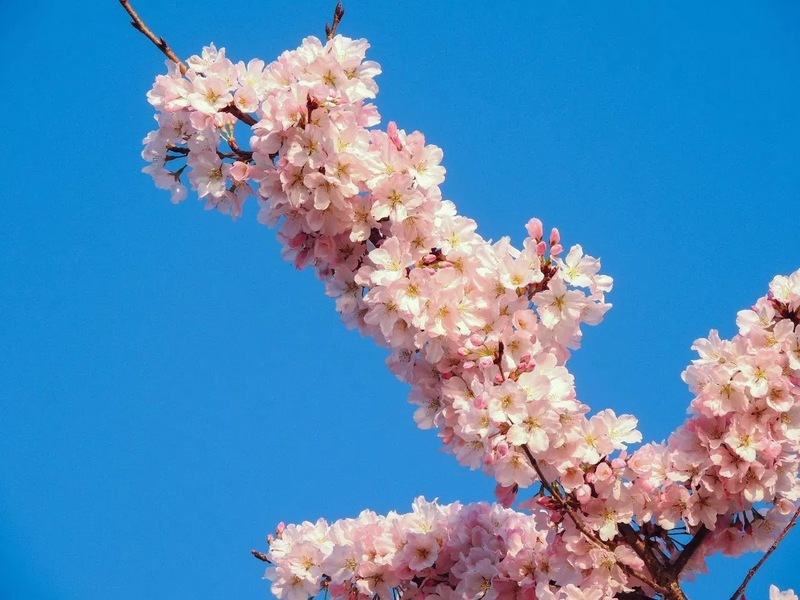 Check out the blossoms at different times of the day as the color and angle of the light can result in significantly different photographs (and real-life views). Also take time to admire the saucer magnolia trees that bloom in tandem with the cherry trees. Some fantastic samples can be found just past the Jefferson Memorial in George Mason Park and behind the Smithsonian Castle. You will not be disappointed. If you are taking the Metro, the Smithsonian stop is less than a half-mile from the main collection of cherry trees. If you are like us, you will do a lot of walking while in DC. When you need to refuel, there are several food courts nearby that serve a variety of offerings. The Reagan International Trade Center, National Place and Union Station are all prepared to handle large, hungry crowds. And travelers who brave the planning challenges and are lucky enough to catch the blooms on the peak dates will be well-rewarded for their efforts.